This division of Palladium Metal Recycling provides a complete range of demolition and dismantling services. Rest assured that your projects - regardless of size - will receive prompt and professional support. Our goals include; safe on time completion while maximizing your recycled metal material. 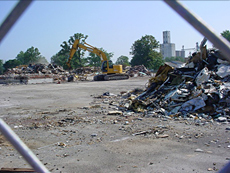 When choosing your demolition solution, many factors must be considered including pricing, professionalism, response time and environmental compliance. We use professional and certified personel supported by necessary equipment to safely expedite your project. We also have certifications to support environmental concerns.